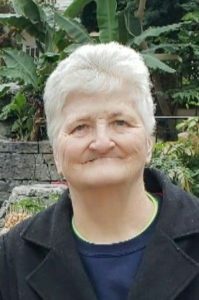 Dorothee Mauntel Hohnstreiter, 66, of Evansville, IN, passed away on March 20, 2019 in Evansville. A Celebration of Life Service will be held at 1 pm CST on Saturday, March 23, at Grace Baptist Church in Evansville. Dorothee was born in Jasper, IN, to Milton and Bernice Mauntel on October 16, 1952. She went to school at the Indiana School for the Deaf in Indianapolis, IN. She worked as an upholsterer for Oldsmobile in Lansing, MI for approximately 30 years. She was involved with Deaf Connections and helped to plan their annual picnic. Dorothee is preceded in death by her parents, Milton and Berneice Mauntel and two brothers, Charles and John. Dorothee is survived by one daughter, Karen. Also survived by brothers, Milton and Jacob and sisters, Sara Wellman and Carma Mauntel.